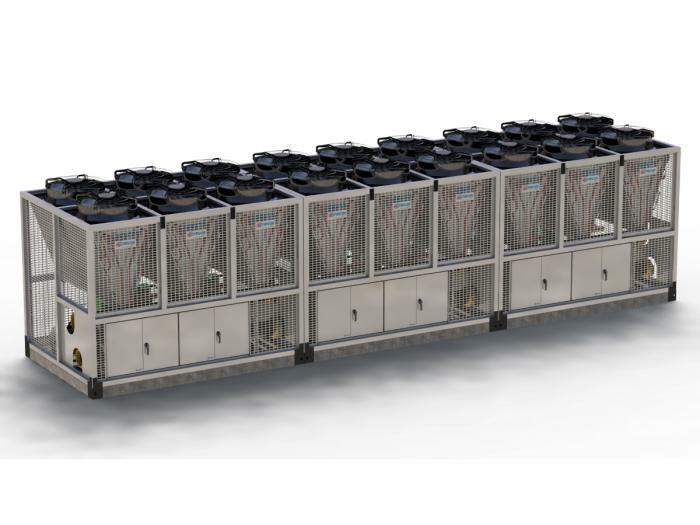 The new FLCH-8S: FriconUSA Large-Sized Modular Chiller, 8 Series Standard, air cooled condenser, is designed to meet most of the demands of medium to large range capacity for air conditioning. Its flexible innovative design allows the modules to work independently in capacities between 90 to 180 TR or grouped in different combinations of sizes to form one or various sets and meet capacity requirements up to 720 TR per set. The quality, high efficiency up to 11.8 EER and exceptional IPLV, according to AHRI Standard 550/590, ensures our customers reliability, low operating cost and long life of the equipment. By using Bitzer scroll compressors with external VFD (Variable Frequency Drive) on the first compressor, we convert this unit into an incredible VRF (Variable Refrigerant Flow) system resulting in a greater adaptability to the thermal load, stabilizing the fluid temperature and maximizes energy savings at partial load. Tandem or trio configuration of Bitzer scroll compressors for better capacity control and high efficiency operation at part load. Built-in, 8” Victaulic connection manifold to easily join units and create a set, simplifying installation. Eco-friendly; Micro-channel Air cooled condenser coil with reduced internal volume, along with the incorporated refrigerant distributor in our innovative, high-efficiency, Direct Expansion (DX) shell-U-Tube type evaporator with built-in refrigerant distributor, reduces the refrigerant charge between 25% to 30% compared to Chillers from similar efficiency. Built-in, high efficiency, shell-U-Tube type, double pass, Direct Expansion (DX) Evaporator with built-in refrigerant distributor provides a significant refrigerant charge reduction.